One such material is tungsten. This rare metal is often referred to as Tungsten (Tungsten), which means heavy stone. Wolfram has a unique and very useful properties. Firstly, it is almost not oxidized, so he is considered one of the most hypoallergenic metals. Secondly, on the strength of tungsten can only be compared with ceramics – it too is almost impossible to scratch it. And the fact that it is Korean manufacturers were among the first paid attention to it, it is not surprising – tungsten, which is produced in this country, is considered the best in the world. 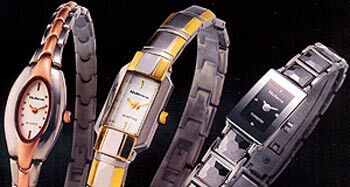 Very reputable Korean makers hours of advanced materials is deservedly considered the two companies – Rolens Company and Brilrand. Company Rolens deservedly gained a reputation for creative organization that seeks to achieve excellence since its inception – in 1950. Currently the company exports its products to more than 50 countries, including Switzerland, Japan, Canada and Middle East countries. Runs the company, Mr. Oak. At the end of the last century, and many watchmakers, Rolens felt stiff competition from its neighbors in China. To avoid losing their market position, Rolens owners decided to change the company’s image to a more modern and progressive. It was then that began the first experiments with new materials. If you see one time clock Rolens, then did not know they can not. Here, you will not meet sophisticated design solutions – all noble moderation. Corps of traditional round shape, non-overloaded dials are designed to enhance the beauty of the material, whether ceramic or tungsten. Among the hours Rolens no models with the same bracelet – to list all the manifold is simply impossible: the combination of steel and ceramic scales to sophisticated ornamental mosaics. All watches are equipped with Swiss movements Ronda. In the jewelry collection Raffaello, in existence since 1995, emphasis was placed on a combination of a variety of materials: precious stones and ceramic, or steel, gold and tungsten. 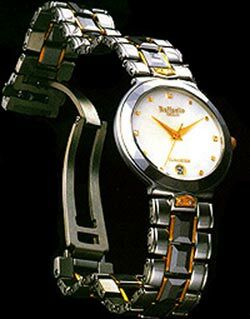 Another direction Rolens – cheap ladies watches made ​​of brass, some of whom are fashion models – coated with a pink gold. Brilrand – the company is a younger but no less well known. Since its inception in 1972, she focused primarily on a combination of jewelry watches and new materials so far been able to gain a leading position in the industry. The company annually produces more than 30 thousand hours, and also exports components Swiss producers. On the design clock Brilrand most suitable under the definition of “classic”: a bracelet so organically building continues, that the transition between them is almost unnoticeable. It is not just an artistic decision – this form is very convenient hand. The basic material from which made ​​all the hours Brilrand, – tungsten. In different lighting conditions it seems that the metal changes color – from almost black to pale gray, so the feeling that the clock is always different. Particularly interesting model line Payfree. This pair of clocks (the direction is now very fashionable). Official distributor Rolens and Brilrand in Russia – “Laniks. Hours of leading Korean brands are able to significantly diversify and beautify any time range saloon and a small shop. A combination of modern design, high tech, jewelry and reasonable prices is the continued interest of buyers.